Years ago I worked for Miller Brewing Company. Part of my job was visiting wholesalers who were independent distributors of our beer. I worked in marketing, so after my pitch on the latest programs from the brewery we would visit key accounts including bars and restaurants in the market. We’d say hi to the bar owners, buy some beers, discuss what the competition was up to, and how our programs were stacking up in retail. Many of these beer distributors were in small towns. I visited places like Snoqualmie WA , Cumberland MD, Ocracoke Island NC, and Harpers Ferry WV. As a recent college grad, this was a great opportunity to see the country and spend time with experienced business owners. The distributors would take brewery reps like me to their best accounts. These were generally taverns that sold a lot of beer. They were always independently owned (not chains) and had a large local following. The formula in all of these accounts was remarkably similar. Keep it simple, sell ice cold beer and great food. Keep it relatively dark and cool inside and hang a lot of interesting stuff on the wall. These were classic dive bars. In search of local dives. Fast-forward many years and true dive bars with good food are getting harder to find. This is especially true if you are living in the suburbs. Around Arlington, are always plenty of places to eat including chains, ethnic spots and high-end concept restaurants owned by restaurant groups and celebrity chefs. Some of these restaurant groups even do a nice job at re-creating the feel of an Adirondack Tavern or a Nantucket Sailing Club. Sure you may feel like you’re in a hundred-year-old tavern, but you’re paying for it. There’s nothing wrong with this once in a while, but just because you enjoy something like a great bottle of wine at an expensive restaurant, doesn’t mean you need to try and recreate that experience every week or even every month. In an expensive area like Arlington Virginia, trying to recreate this dining experience weekly can add up to a couple of car payments every month. This is where the local dive becomes important. They’ve spent very little on decor. There is no wine list, just what’s on the table tent. The focus is on value. If you’re a Frug, you need to seek these places out. You need to support them. I’m not talking about hipster dive bars. These are very easy to spot. I can find any number of them over the bridge in DC. They may look like dive bars but they charge eight to ten dollars for a cocktail or seven dollars for a microbrew. Sadly they are often the victim of location (high rent district) and no short supply of urban hipsters. More power to them but they’re off my list. How to spot a true dive. These are getting harder to find. It’s coveted by the locals. Reputation and repeat business from regulars is what keep these places going. Ask around. The floor may be dirty but the dishes and glasses are clean. Serving ice cold beer or a cocktail in a perfect spotless glass is a true dive bar’s bread-and-butter. The menu is simple, and generally unhealthy, but the quality is there. The price is right. 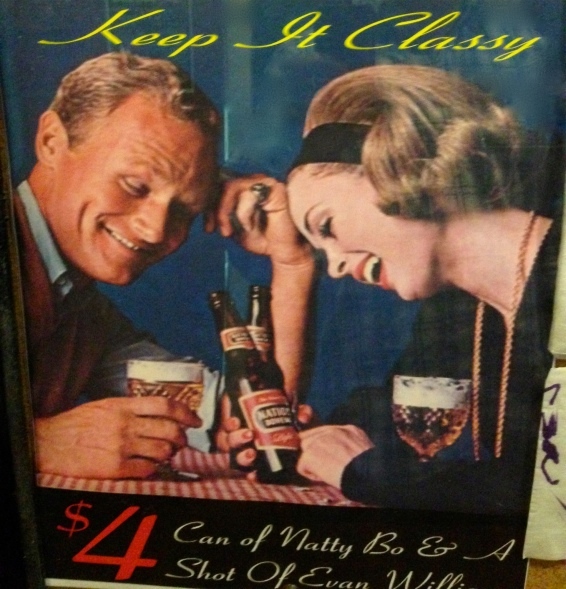 They should offer a good selection of old-school domestic beers like Miller High Life and PBR for about three dollars. The taps are clean. If you get a funny tasting draft beer, be suspect. A good dive bar will have very clean beer lines, just like a great Irish pub will pour a perfect Guinness. A good amount of the decor has been provided by local beer and liquor companies. Some of the stuff hanging on the wall is over 50 years old. It’s not well lit, which helps hide many imperfections. The kitchen is simple and clean. You can hear the cook complain about your order. If you like to go out once a week or so, try seeking out the best local dives. Heres how. Explain to your wife, friends or significant other that you want to try something different and that this will be a new experience. Do your research. After all if you find your favorite local dive you may be going there for 10 years or more (like we have) so it’s worth a little bit of effort. Start with Yelp or Foursquare. If you don’t have the app it’s just as easy to visit Yelp.com. Create a free account so you can bookmark your dives. Do a search for dive bars or dives. Look for 4 star ratings on Yelp and Google Maps or a rating of 80 or higher on Foursquare. Don’t just stop there, browse some of the food comments this is always a good indicator of the quality of the dive. Do a test dive. Don’t just show up for dinner on a Saturday night. Maybe stop by for happy hour and try some chicken wings to get a feel for the place. It may turn out not to be a place you want to eat but the drinks and bar food may look great. While you’re trying it out share your thoughts on the yelp app or foursquare. Keep searching. Like most other things in life, you only need to find one. Can you share a few of your favorite dives or would that be inappropriate??!! Good idea right? These are local to DC, NYC, Baltimore, Arlington and a few other places. Love it Brad, nice job. Where is the bar in the bottom photo? Looks like a place in Saratoga Springs in an alley I used to visit. Love dive bars. The dive bar photos I have are lame. I pulled this one of the web. I am guessing somewhere in Wisconsin.